It’s September – time for all things autumn and back to school! What a great time to get clean and organized! HHH#1: Start with your clothes closet – put your summer gear away and take out your long sleeves. Throw away any flip-flops that got worn out this summer. It’s a great excuse come May to buy a new colorful pair! HHH#2: Reestablish any routines that went by the way side during the summer. Weekly menu planning, back-to-school procedures, etc. Discuss the reestablishment at a family dinner this week. You can also discuss your favorite moments of the summer. HHH#3: Start (key word – start! not decide!) to discuss your holiday plans and travel. Who’s going where, when are you seeing which relatives, what are we hosting… talking and planning this out now will save it being a stressful conversation when it’s closer to the holiday! 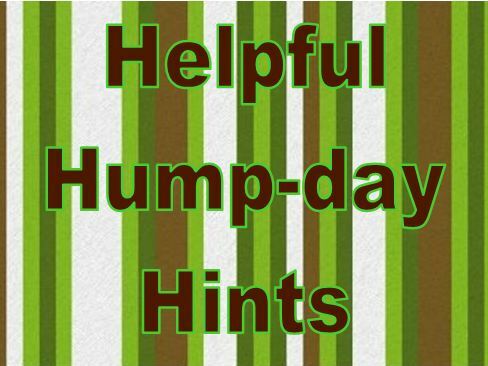 I already have a head start on #2…I am reestablishing my weekly blog post of Helpful Hump-day Hints!